Rumors that T-Town Menswear owner Tom Al-Betar switched allegiance from the Tide to the Tigers after being disassociated by the University of Alabama Athletics Department are totally false. 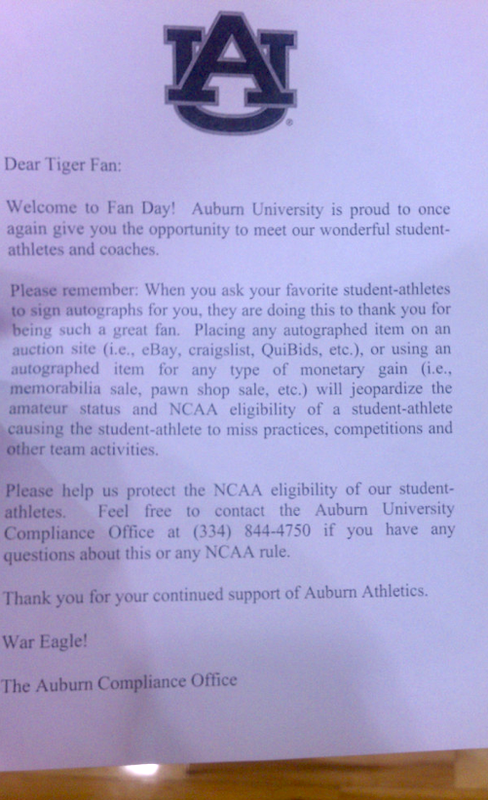 But as can be seen in this letter distributed Sunday at Auburn’s Fan Day, Auburn’s compliance department wasn’t taking any chances. TWER correspondent Big David Mullins was handed three just while waiting in the Onterio McCalebb line. Gee… I wonder how AU’s compliance department views the T-town Men’s Wear situation. It would appear to me that they clearly believe there was a violation somewhere. I’ve never done anything remotely like that, but I did not realize it would be illegal. How could anyone prevent fans from doing something like that, when it doesn”t involve the knowledge or cooperation of any players? Ha I will not sell the good autographs I got Sunday!!! War Damn Eagle!!! It’s not “illegal” (i.e. against the law), but if the university knows about it and doesn’t do anything, it’s likely a violation. This note serves as their due diligence.